Hello! How are you doing? I am up so early with this time change! It’s ridiculous. I woke up at 3am and made myself just lay there until about 3:30 when I knew I wasn’t going to fall back asleep. C’mon body clock! Catch up. Oh well, at least I can get a jump start on blog work before I run. Since I’m up and at ‘em let’s talk about all the fun food from this weekend. 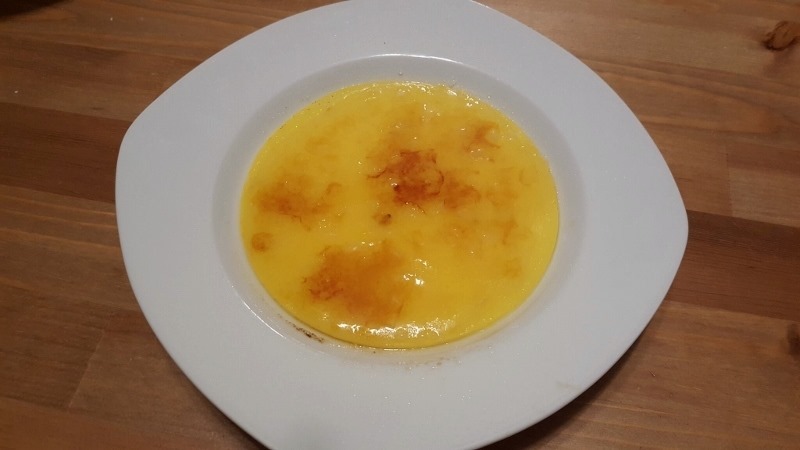 I bought a crème brule mix to make recently. It’s not one of my favorite desserts (because it doesn’t include chocolate) but my mom and Ben both love it so I wanted to see if I could make it at home. We had no idea what we were doing, but we did it (this could be the title of my life story). It was good, but still not my favorite thing. Luckily I had dark chocolate – that’s my jam. I also made a few chicken breasts so I’d have some quick and healthy meals ready to go this week. I never cook for one – it’s all about leftovers. While I was at the mall buying those new Quest Bars I went to a new eyebrow threading place. When I go to my usual place I just see any girl that’s available. I’m not super picky. 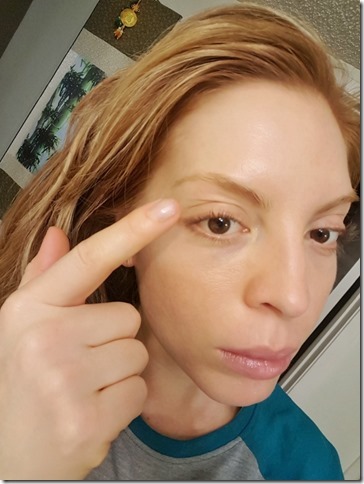 I just tell them to clean them up because I need them thick since my brows are blonde. They’re hard to see anyway so I can’t afford to have them sparse or thin. Well, I feel like she made them thinner and there is a weird piece missing from one side. It was like a bald patch, but in a straight line. Boo. 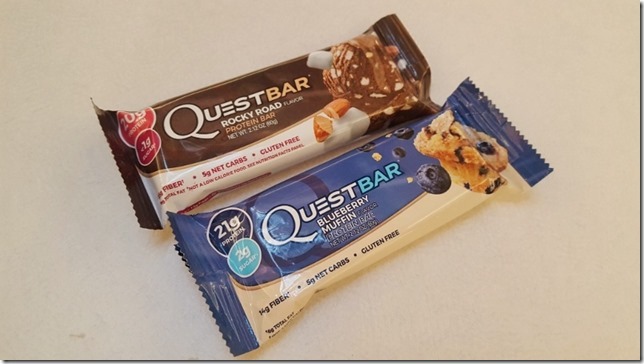 The two newest Quest Bar flavors are Rocky Road and Blueberry Muffin. Not too long ago Quest also came out with Smores and Oatmeal Chocolate Chip. Here is the Blueberry Muffin flavor – it is a vanilla-y base with pieces of blueberry and some kind of graham or streusel. Thoughts: Good, but tastes a little artificial. It’s sweet (which I like). 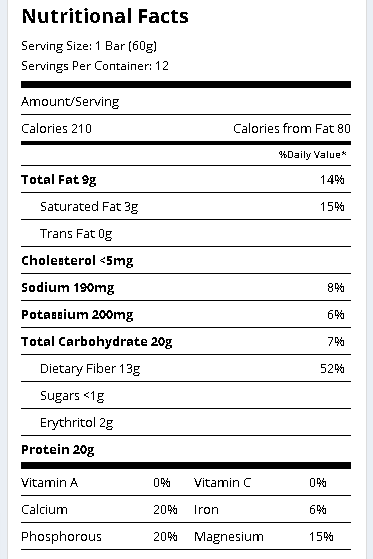 Sometimes the fruit pieces in Quest Bars are a little too chewy and artificial tasting (it’s weird because I don’t always feel like this, so it might also be my taste buds). Thoughts: Chocolate base is kind of mild, not super sweet or chocolate-y. There are a lot of nut pieces in it, but I didn’t notice tasting or chewing the marshmallow (I saw white pieces though). I prefer the bars with a vanilla base and chocolate pieces in it. 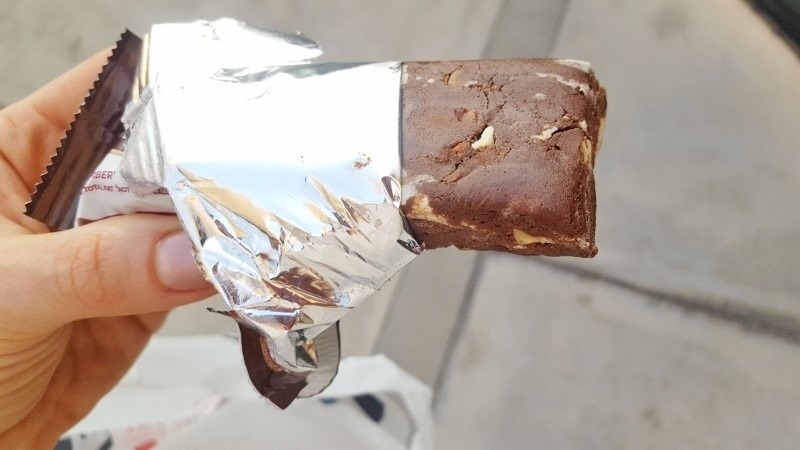 Overall: I still think Quest Nutrition makes the best tasting protein bars ever. I’ve tried so many different types and brands and it’s not even close. Yes, they’re expensive, but they really do taste like a dessert – especially if you bake them. It’s the first Monday of Pile on the Miles! Are you ready to rock it? 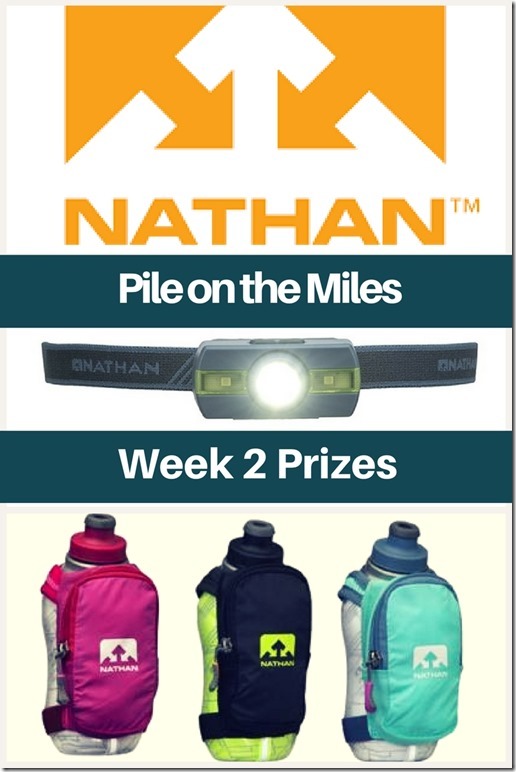 This week’s running challenge is sponsored by Nathan. They are giving away a Speedraw Plus Waterbottle and Neutron Fire Runner’s Headlamp everyday this week! Check in each day with your POTM update to be entered to win. It’s perfect timing for the headlamp because November is Runner Safety Month. 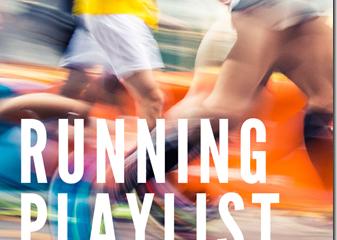 The days are darker and it’s hard to see and be seen on early morning or late evening runs. Even if you aren’t running in complete darkness visibility is very important. Bikers and drivers may be distracted or unable to see you – BE SEEN and BE SAFE. *Use #RERMiles on social media to share your progress!! Check out this post for week 1 winners! Question: What are you doing today for Pile on the Miles?? Me: I’m headed out to run in a bit – I’ll check in later! 5 mile run today! 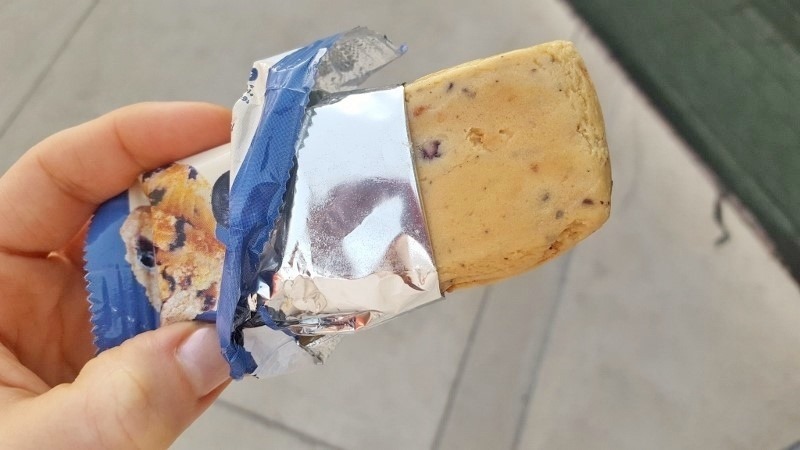 I love Quest bars – I know they’re expensive but they’re so great and easy to have on hand for a quick snack! Missed yesterday’s post somehow, but did 95 minutes on the elliptical. I’m late on posting for Monday, but I did 1.77 miles (always a weird number). Ran a quick 3.5 today!! I forgot to check in yesterday! Hopefully this still counts! I spend 35 minutes on a spin bike. I did 10 min WU, 3×5 min with increasing resistance and 5 min cool down. 4.5 miles yesterday (monday) and 3 planned for today! and lmao our eyebrows are about in the same state right now. I don't quite feel like myself anymore. I hope they grow out soon! Started the week off right with a 3 mile run before work and a yoga class after work. Today I did 3 miles in the dark! Pros: nice and cool and less light for people to see my sweaty red face. Cons: parts of the park are darker than others and make me think about kidnappers and I need to remind myself to bring pepper spray JUST in case. Rest day today, but I made sure to walk to and from work! Rest day today but took the dog for a walk twice for a mile. I had volleyball tonight, which is a lot of fun, but surprisingly does not get you very many steps. So I was running laps in between games to make sure I got my 10,000 in! Vinyasa yoga tonight, run tomorrow! Overslept and missed my track workout – oops! But hit up the gym after work! Yay!!! Today was 4 sunny perfect fall weather miles! Went to a new yoga class tonight.. amazing! I’m resting due to a sinus infection. Hoping I feel better tomorrow! Rest day from running, still did my planks though! Today was stretching and foam rolling after yesterday’s half. 4.5 mile run today to make up for all the fun I had over the weekend. Only 2 weeks till my first race of the season. I ran 2 miles on the treadmill and then did legs today. Nice run on my lunch break. Thanks for keeping me accountable. 4 miles on the treadmill. We have several large wildfires in the area and the air is thick with smoke. I’m sticking to indoor running until the air quality is better! 1 mile broken in half because kids. Rest day today. Trying to kick a lingering cold. My evening focus was watching my baby that had 5 shots this afternoon. Hoping to get out tomorrow! Today I foam rolled for rest day! I Did Body Pump and then 4 miles on treadmill. Some lower body strength training and stretching to start the week. Another forced rest day for me. I was able to get an appointment with my podiatrist this Friday. Hopefully, my foot will fix itself before that so I can cancel it. I reached my goal today! I am at 23,000 steps. I did 15 minutes on the elliptical this morning and walked 2.2 miles on the treadmill. The rest of the steps are from walking to and from school and teaching all day. I also get in 2,000 steps every day at lunch!!!! My IT band has been bothering me so I took an easy walk instead of a run today! 1.5 mile incline walk today! 45 minute walk with the Kardashians! Well, maybe I walked and they just talked a lot. Kim’s fear of driving is fixed, so I think that’s a great walk! Today is a rest day after a weekend of running! 3.5 miles this morning plus core work! Walked 1.5 miles this morning with my minions and hit the gym this evening! I’m almost done with the first phase of Strong Curves. Ran 2 miles of speed work. Rest day! Back at it tomorrow! Quick walk after work so I could enjoy the last bit of sunlight and then 21 day fix dirty 30! 4 miles on the treadmill while watching Finding Carter, my newest obsession. 3 this morning with a good friend. Nothing beats a good run to catch up and vent! First rest day for me since the start of POTM! Four miles of walking/running this morning for me. 3.5 miles this morning at the track!!! I will be sad when the snow hits and I can’t use it any longer! I think your eyebrows look great! I was a slug today and did nothing healthy. Okay, I didn’t drink gasoline. I suppose that is the healthy thing I did(n’t) do. Today was a much earned rest day after 56+ miles last week. However, I hope to pick up the pace this week. I normally count my miles from Monday to Monday, so I might have to adjust things. 16,000 steps today-beat my daily average goal of 13,000! Today I did a 20 minute walk and went to PT for my plantar fasciitis (60 min)! Then some weights and core work when I got home, success for the day!! 5 miles today. I am having a difficult time with the time change too. I always feel tired and sluggish for the first week or two. 5 miles in the wind today! Ran 5.1 stroller miles with my Little today! I got in a 3.2 mile run before volunteering in my sons Kindergarten class. 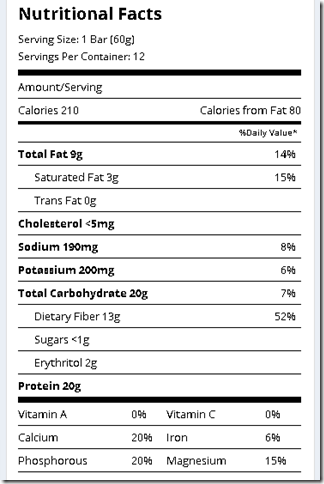 Quest bars are the best. I also love the Costco brand ones, they are almost as good and wayyyyy cheaper. I have the rocky road one at home to try, can’t wait! Today I walked over my lunch hour and I’m lifting weights tonight. I’ll be running more this week, it’s finally fall here and I love it! Strength training for 30 minutes and walked the dogs for 30 minutes! I was short on time but did a 2 mile run and 15 minutes strength training. I took a nice long walk today and am planning doing some strength training later this afternoon! I got in a 7.3 mile run today which is the longest I’ve run since the end of August! Yay! Weight training this morning – 165lb deadlifts and 79lb goblet squats. YEAH! Ran 2.3 miles this morning! I did 30 min of strength training and walked 2 miles! Yay for Pile on the Miles. I ran three miles today, which in itself isn’t that big a deal, but I also pushed my 25-lb. baby in the jogging stroller, which I loathe, so I’m proud of myself for getting it done. 4 miles in before work. Because of a foot injury I haven’t ran in a month, and this felt soooo good! 4.5 hilly miles with momma today! Lower body weight workout and a walk for me today. Well deserved rest day after NYC marathon. I did 31 minutes of strength training! I ran three miles on this gorgeous fall day! Dreading winter treadmill runs, so I’m enjoying every single run till then! Today a yoga class very early in the morning before a super busy day! 5.75km done before 6:30am this morning! It was chillier than I was expecting, but I was ok, and happy because I hatched an awesome Pokemon. Today is my anniversary, and since we’re going out to dinner, no workout for me. But, I did make sure to step up my pace while walking to the train, and from the train to my office. I’ll be sure to do the same on my way home as well. Did my mile yesterday in some cold windy rain and another mile today. Planning on an easy run after work tonight! 3 miles fast and 1 mile cool down! Followed by planks to the “Bring Sally Up” song…search it on YouTube!! Today is a cross train day, so I did Jillian Michael’s Ripped in 30 this morning before work. I’m also planning on doing some yoga for runners tonight before bed. Boot camp arm day. How does the baby always know when it’s arm day? She’s wanted to be held all day. P.S. she was up super early too. Daylight savings is the devil. I went on a 45 minute walk with a friend at lunchtime today. It’s our favorite way to catch up on life! Going to a fitness class tonight. I feel the need to mix things up. 5 miles this morning, legs felt heavy after a busy night at work last night. 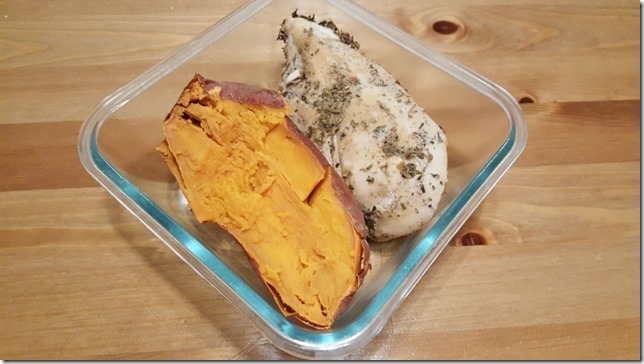 Rest from running today – this is taper week! I went for a 1.5 mile walk just now around my office building – it’s so nice outside. And the dog will get a walk tonight! 11 mile run yesterday and this morning was a 35 minute strength interval workout before work. Feel great! Rest day for me, so used it to foam roll out some kinks. There’s 3 miles calling my name after work today! I kicked off the day with 6 easy miles today! Gm! 2.5 miles to start the day. Body pump tonight. Early morning running session in the dark. Thinking I’ll get out this afternoon to make it an even 4. Great first week! Got 5 miles in this morning. elliptical and leg lifting at the gym this morning, and hot yoga after work! Today is rest day. Which means I’m cleaning the house from top to bottom (not much of a rest:( ) I’ll also foam Rolland stretch! This challenge has been great for keeping me accountable! Thank you! Yoga with Adriene video tonight! 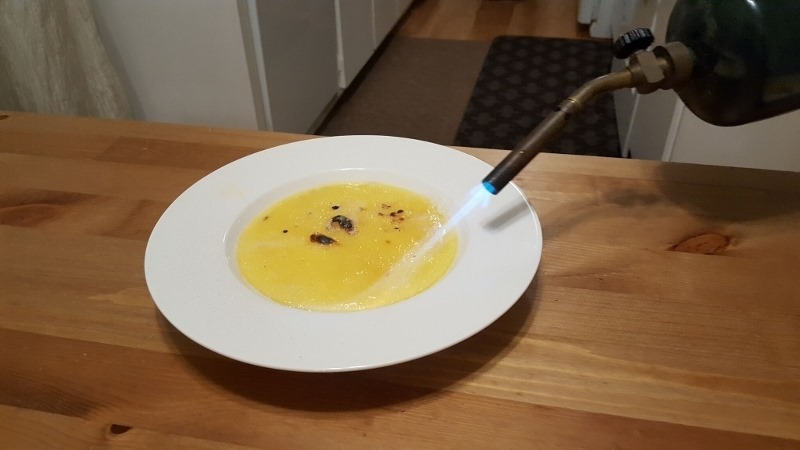 Have you ever tried the Oh Yeah! One bars? They have the same nutritional makeup as Quest. I used to love Quest bars, until I tried the Oh Yeah! Bars. 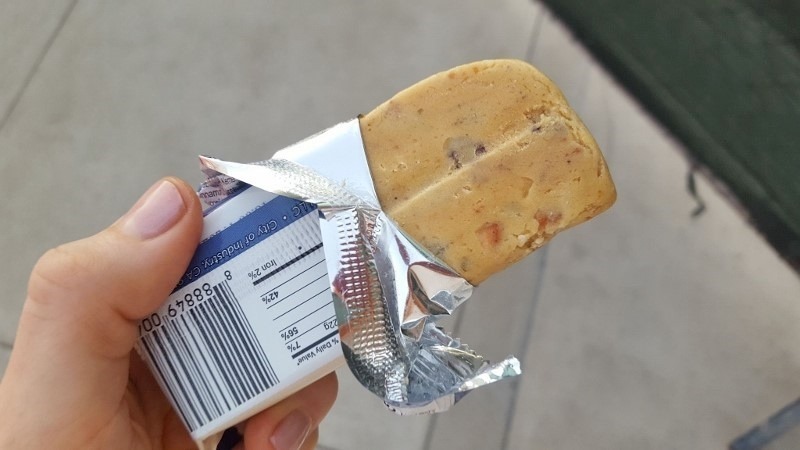 Seriously, I feel bad when I eat the chocolate chip cookie dough bar, because it honestly feels like I am cheating. But, I had a nice sweaty weight session this morning…my legs will be hurting tomorrow! I do plan on getting in a mile walk on my lunch break! Yesterday was supposed to be my rest day, but I spent two hours shoveling dirt in my front yard. Good times. Today is my down weeks for 531, which means low level OHP, plus DL, since I’m packing two days into one. Then running, somewhere between 3 and 5 miles, depending on how I feel. Love the chocolate chip cookie dough and oatmeal chocolate chip Quest bars. Best substitute for cookies yet. 4 miles today. Feels great to be back to 30-35 miles per week after cancer treatments. Rest day for me after running half marathon yesterday. I will walk after work when it isn’t raining. And hopefully tomorrow my legs will be ready for a couple easy slow miles. 8 miles of running…1 mile of walking. 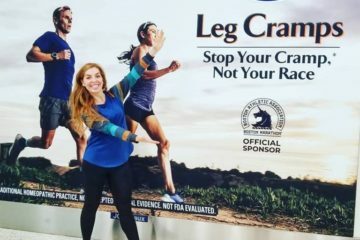 Half marathon is in less than one week! Rest day though doing some stationery biking but slow-ish! Rest day today after a few 3-5 mile runs and some beachbody on demand yoga and pilates this weekend in Delaware. Got to explore my sister’s new neighborhood! Teaching two workout classes and then running 6 miles on my lunch break today! hitting up the treadmill after work today for some miles. I usually run in the morning, but my body clock was off b/c of the time change and it was a bit too chilly for me. Ran 13.1 yesterday while watching the NYC Marathon!!! That is why I don’t let anybody but myself to touch my eye brows. Today is strengthening day for me! I tried to run 3, but my leg is sore from saturday’s long run so I ended up walking 2. About to jump on the treadmill for three miles. Coming here to the ol’ blog first for some motivation! I will be doing my weekly barre class tonight! I piled on 12 miles today! I am so picky about who I let touch my eye brows. They got so thin and sparse that I just left them completely undone last summer — I have dark & thick Korean hair — and by contrast, super pale skin — so my brows STAND OUT… so even the littlest hair out of place looks weird. Now that I’ve let them grow in, I feel so protective of them! I’d rather sit home and tweeze than let anyone I don’t know touch them. I am going to do an easy three miler today and then lots of stretching! I’ve ran the past two days and my PT told me to slowly work up to running multiple days in a row so today it was back to the elliptical and yoga! Today is foam rolling and stretching. Still sore from Saturday’s run! Today is resting after a long run yesterday. Will do some stretching and some hip and leg work with bands.